Mark Cross does not have the known history that the neighbouring villages of Rotherfield and Mayfield do. The article in North Weald 3 years ago seems to be all that is known and is very comprehensive, not much can be added to it. Mr. Henry Dixon of Frankham had a son. Henry, and three daughters - Lydia, Mary and Kitty. He built 'Little Frankham' for his son and 'Strood House' for his daughters. The writer well remembers these three old ladies being driven around the village by their coachman, Mr Chatfield, at Christmas delivering parcels for the children at the school. Mrs Henry Dixon must have been a deeply religious lady for on the fly-leaf of a hymnbook given to Lydia when a girl, she has written these lines: "No light nor love nor life from duties spring where Jesus is not Prophet, Priest and King". It is probable that Mr Henry Dixon built School House, for this is where the Head Mistress and teachers lived until 1924. Miss Yates was the Head Mistress for the first 23 years of this century. She maintained discipline by a kind strictness. A wonderful Head Mistress. At the turn of the century a Mr Chadwick lived at Frankham. He had a son, who was a captain in the British Army during the Boer War. When he returned home after the war, the people of Mark Cross took Mr T. Pollington's landau to Rotherfield Station and twenty young men of Mark Cross area took the place of horses and drew him to Frankham. The next day Mr Chadwick Senior gave a treat to the children in the field opposite the Church and the following day to the adults at Frankham. The Brickyard in Mark Cross closed in 1937. Bricks, tiles and drain pipes were hand made and the kiln was fired with wood. It took 3000-4000 fagots to bake one kiln load - 12000 bricks, 8000 tiles and 2000 pipes. 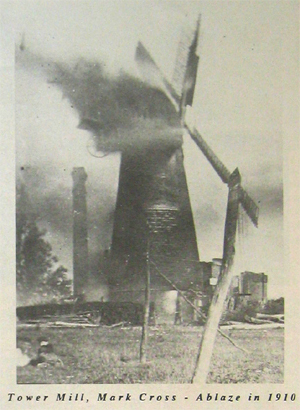 The Windmill was burnt down in 1910. In the picture of it being cleared up after the fire the man in shirt sleeves is either Mr Frank Walter or Mr Edward Walter, one of the owners. 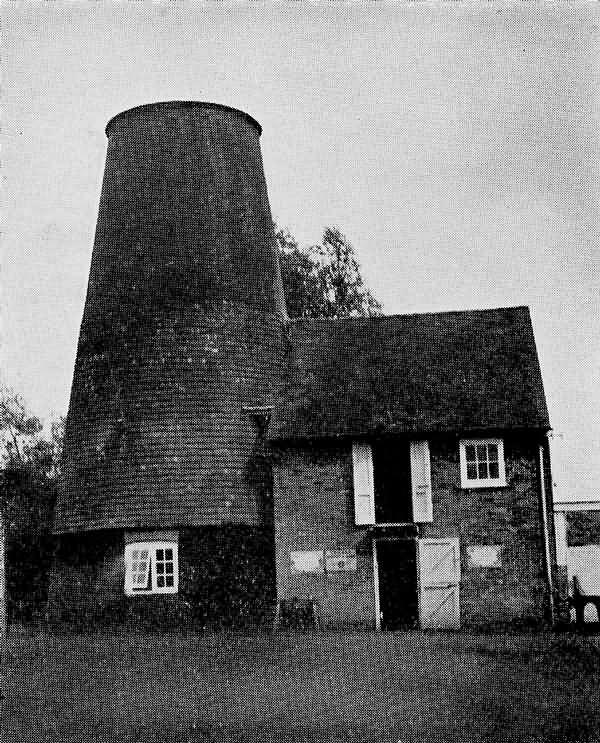 After it was re-built a gas engine was installed to drive the mill. This engine made its own gas by burning anthracite and was working until 1945/50 when SCATS bought it and installed an electric one. Now, of course, it is a dwelling house. The note in Col. Eeles book on Mark Cross stating that from the time of the fire it was a warehouse is incorrect. In the early part of the century and immediately after the First World War, Mark Cross had a very strong cricket team. In the early 1920’s the captain was a well known personality Mr 'Bob' Wansbon. He led Mark Cross to victory when they won the Crowborough and District League Challenge Cup. He was also village postman for many years. Three attempts, in the writers memory, were made to run a football club. These all failed. In the early years of the century there was work in the village for all the inhabitants. There was a grocers, butchers, wheelwrights, blacksmiths, bakers, millers, brickyard, coal merchant and a taxi service with horses and traps. In addition, farming, in which many were engaged, and the large houses around employed many inside and out. For instance the writer remembers when 'Frankham' employed 8 - 4 inside and 4 out. This has now all gone. The only one remaining is T. POLLINGTON & SONS and their base is now at Crowborough. Mr T, Pollington first came to Mark Cross in 1870. His elder sons went to school at the Church when it was a school and his younger to the new school. Three generations of that name attended the school, the last one Janet Pollington (a great grandaughter of T. Pollington) leaving in 1956. The first person in Mark Cross to own a motor car was Capt Drummond of Bassetts. He had a Studi-Baker and in those slow and carefree days maintained he could get from Bassets to Tunbridge Wells in 20 minutes. One well remembers 11th November, 1918 and the Rev. J. Price announcing the Armistice in the school. We were immediately dismissed and then marched up the street singing the National Anthem. In 1921 the Misses Dixons' took all the children over 10 years to an 'Africa and The East' Exhibition at Islington. Going from Rotherfield station to Victoria. At Victoria they had arranged for three large Wagonettes, each drawn by a pair of horses to convey us through London. What a thrill for country lads and lasses. In 1924 Mr and Mrs J. Boldero, who then lived at Frankham, took us all to the British Empire Exhibition at Wembley. They hired two of the Beacon Services 'char-a-bangs', not streamlined coaches then but open tops and some had solid tyres. The journey in those days took 4 hours leaving Mark Cross at 7am arriving at Wembley at 11.30am Another thrill for country nippers. When the Mark Cross brickyard was being moved from Sandyden the drying sheds were stripped of their tiles and then carried on the shoulders of a number of men and placed directly on the posts already erected. There were at one time a number of such brickyards in the area. One was in the Strood field just by the school. The site of the kiln is marked by the deep hollow in the field. This was the school cricket pitch when we were boys around the 1920’s. There were also brickyards at Spratts Read, Lake Street, Sheriffs Lane Rotherfield. Broad Read, Five Ashes and Liversys' Brickyard at the trip of Yew Tree Lane, Rotherfield. The wall around Trulls Hatch was built by bricks made there. Most of these brickyards also made flower pots. 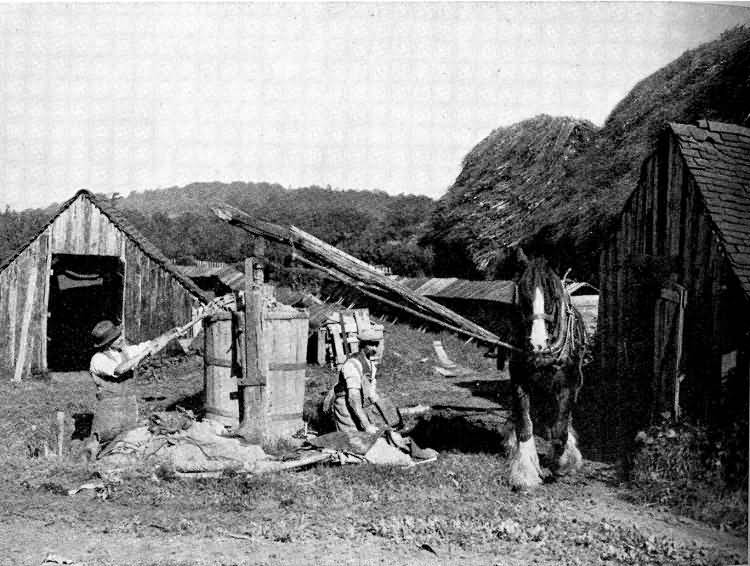 A flourishing industry in this part of East Sussex during the last half of the nineteenth century. Most of the old brickyards mentioned were fired with wood and everything was done by hand. No making could be carried on from the end of November to April because of frost. The drying sheds for flower pots, tiles and pipes were open-sided and the bricks stacked on hacks outside. The winters were spent in cutting wood and making what was known as brush or kiln fagots for firing the kilns. The other winter occupation was digging the clay. This again had to be done by hand, the top two or three spits were used for bricks and the next two or three spits were heavy blue and yellow clay for flowerpots, pipes and tiles. This was thrown up in two large mounds to be 'weathered'. In the winter of 1878/79, Mr T. Pollington and his two elder sons walked each day from Cooks Corner, Crowborough to Mark Cross to dig the clay for the Brickyard they were to take in 1878. The clay was carted to the yard and tipped into shallow pits and well soaked with water. At the edge of the pit was what was known as a Pug Mill. This was approximately 4' in diameter and 6'-8' deep. A spindle went down through the centre with iron blades fixed at right angles to the spindle. Fixed to the top of the spindle was a long pole extending outwards to which a horse was harnessed and went round in a circle. By this means the clay was made malleable and ready for use. The bricks were made by hand in a mould then laid on a barrow and laid on the hacks to dry. The other products were made in another shed. The tiles were made in a mould. flowerpots on a wheel and the land drainpipes in a small machine pumped by hand. When they were dried hard, the kiln was filled first with bricks and all moisture dried out, then filled with other material and dried out completely. After this the firing was gradually increased terminating with 4-5 days continual firing night and day. These kilns were about 6' deep and 12' above ground. They varied in length and breadth. Underneath the bottom ran two, three or four tunnels according to the size of the kiln and in these the faggots were burnt. The floor had flues across every 10", the bricks etc. being stacked so that the flues went right up and through to the top, which was sealed. The 'dial' for telling when all was fully baked was a brick placed on end and was on both edges of the kiln, and one in the middle. By the human eye you watched and when the middle brick had sunk the thickness of two bricks the material inside would be burnt sufficiently.